Items are sold through this website by Christian Louboutin Canada Inc. (hereinafter referred as “Christian Louboutin”), having its registered office at 800, Place Victoria, Bureau 3700, Montréal, Québec, H4Z1E9. PLEASE NOTE THAT ALL DOLLAR VALUES ARE IN CANADIAN DOLLARS. Residents of Québec means residents of Québec who enter into a contract to which the Consumer Protection Act (Québec) applies. The below terms of sale govern purchases made through Christian Louboutin website. For United States orders, shipping and returns information, please select United States as your country on the homepage. If you have forgotten your password, we can send a new password to you through a secure connection to the email you submitted upon registration. Click here to receive a new password. Once you have successfully logged back into your account you may change your password. Based on availability, orders can be placed online directly though Christian Louboutin website or by contacting one of our online personal shoppers. Online purchases from this section of the website may be made by residents of Canada for delivery to clients in the Canada. Christian Louboutin is unable to deliver online purchases to other places at this time, but invite our clients to reference our store locator. Although we make every effort to keep sufficient stock of items listed on our site, occasionally we do sell out of certain styles. If we are out of stock on an item that you've ordered, we will notify you via e-mail. Any changes will be reflected in your order total as well as your shipping confirmation. We reserve the right to limit the quantity of products we supply, supply only part of an order or to divide up orders. We give our clients the opportunity to reserve an item before it becomes physically available online by placing a pre-order. The item is reserved for you and then charged and shipped automatically when the stock arrives at our warehouse. Pre-ordered items must be charged and shipped separately. Please note that product arrival dates are estimates and are not guaranteed due to varying production and shipment time frames. We will inform you if for any reason your order fulfillment is delayed or cannot be completed. Please note that your credit card will be charged in full only once your order is shipped to you; however, a $1 authorization may be held on your credit card until that time. Orders are processed and delivered Monday through Friday, excluding holidays (unless Saturday Delivery is your chosen shipping method). Prices displayed on Christian Louboutin’s website are quoted in Canadian dollars. While we try to ensure that all prices on our website are accurate, errors may occur. Not applicable to Residents of Québec:If we discover an error in the price of the merchandise you have ordered, we will give you the option of reconfirming your order at the correct price or canceling it. If we are unable to contact you within 48 hours, we will treat the order as cancelled. You agree that the risk of loss or damage to products you order from this website passes to you on delivery of the products, provided that we have received payment in full for the products. (i) Canadian Provincial Sales Taxes (PST), Goods and Services Sale Tax (GST), and Harmonized Sales Tax (HST) will be collected on each order when applicable. (ii) PST, GST and HST are not applied to other Canadian taxes. (iii) Quebec Sales Tax (QST) will be calculated on all orders shipped to Quebec, and is based on the order’s retail value. (iv) PST taxes will not be collected for Nunavut and Prince Edward Island; they are the responsibility of the customer. (v) All taxes are calculated and listed separately and a sum value is indicated under Tax. For security reasons, online purchases will require an adult signature upon delivery. All purchases are shipped via UPS. In addition, purchases may not be shipped to P.O. boxes or APO/FPO addresses, which are not available through UPS. We do not ship to Freight Forwarders, hotel locations, or any establishments at our discretion that may pose a risk to the security of the package. Christian Louboutin cannot be responsible for unanticipated delays. All orders placed on a weekday before 2:00 p.m. (EST) will generally begin processing that day. Orders placed after 2:00 p.m. (EST) will generally begin processing the next business day. Orders placed on weekends or holidays will generally begin processing on the next business day. All orders are subject to review and Christian Louboutin reserves the right to request additional identification information and to ship the order to the billing address. The billing information provided must be able to be verified and must match what your bank has on file. Please ensure the card holder is available to confirm the order details. When you place an order on our website, we will only charge your credit card once we have verified your card details, received credit authorization, confirmed stock availability, and your order is ready to be shipped. Your credit card will not be charged at the time you submit your order but will be authorized for $0.00 or $1.00 for verification purposes. Order processing time begins as soon as the order is submitted, but may take up to 24-48 business hours should we need to reach out for additional verification. Packages arrive within 2 business days, provided your order is placed by 2pm (EST). Packages arrive within 1 business day, provided your order is placed by 2pm (EST). All cosmetics will be shipped via UPS with a signature required, as per our standard policy. All purchases will have tracking information sent via email once the order is processed for shipment. Please note due to packaging restrictions and safety procedures, all fragrance products can only be shipped via UPS Standard at no cost. This limits all fragrance products from shipping to the following regions, as per UPS policy: Northwest Territories, Nunavut, and Yukon. To ensure the security of your delivery, we do not provide tracking numbers. However we will provide a link for you to track the progress of your package in your shipment confirmation email. An email confirmation is automatically emailed to you once your purchase has been shipped. Please note that packages can only be intercepted by a Christian Louboutin online representative. For security reasons, we cannot reroute your package to a new address. Should you not be available to sign for your package, we can arrange a will call at your local UPS facility on your behalf. Once you have received your order, if you are not completely satisfied or if there is a discrepancy with your order, please retain all documentation and packaging and contact us immediately by calling 1.888.8LOUBIS (1-888-856-8247) or by sending an email to customerservice.ca@us.christianlouboutin.com. Please be advised that if you wish to cancel or modify your order, please send an email as soon as possible to customerservice.ca@us.christianlouboutin.com. We will make every effort to accommodate your request. However, once an order has been submitted and has begun processing we cannot guarantee the purchase can be cancelled or modified. Please note that at this time merchandise purchased online cannot be returned or exchanged at any of the Christian Louboutin retail boutiques. Please note any item deemed final sale on the product page cannot be returned. For online purchases Christian Louboutin will accept merchandise in its original condition for refund/exchange when accompanied by the original sale slip and is subject to the issue of a Return Merchandise Authorization Number. Returned merchandise must also include the original shoe box, dust bag, heel taps, and adhesive sole tags. Merchandise must be returned to us within 14 days from the date of delivery (i.e. return shipment must be postmarked within 14 days from receipt of your order). Shipping costs are non–refundable. All shoes must be tried on for fit and size on clean, carpeted surfaces only until you are sure that you will be keeping them. Our red soles are very delicate and we cannot accept returns on shoes that appear worn or damaged. The red sole must be in perfect condition. Returning shoes of which the soles appear damaged may result in a refurbishment fee equal to the cost of restoring the sole to its original condition or may be refused if unable to be refurbished for sale. The cost of a refurbishment fee will vary based on the severity of the damage and typically ranges from $40.00 to $60.00. In rare cases it may be more. We thank you for your understanding. Log into your account, or search for your purchase within the ‘Returns’ section on the website, or by clicking here. Select the items you wish to return and follow the prompts to complete your RMA request. Once confirmed you may email or print your prepaid UPS return label for shipment. This must be initiated within the 14-day window. Include the original receipt. You may also print your order confirmation email if need be. Ensure that the clear adhesive sole tags are attached and include the original shoe box, dust bag, and heel taps. Do not use the Christian Louboutin shoe box as a shipping box. Please place in an appropriate shipping box and affix our prepaid return label. Keep a record of your tracking number. Drop off your package at a staffed UPS store and collect a receipt for your records (for your closest location please visit www.ups.com). Do not use a drop box location for security. Christian Louboutin may refuse return or exchange on merchandise that does not meet the above requirements. If your package is not accepted, it will be sent back to you and a refund will not be granted. Christian Louboutin will not assume responsibility for reimbursement or compensation in the event a return package is lost, stolen or mishandled. Please keep all tracking details for your records. Every effort will be made to ensure a prompt refund or exchange and an email notification will be sent once your return has been processed. Once your return is received it will be inspected. If the condition of the merchandise is acceptable then a credit will be issued to the original form of payment within 10 business days from the day of receipt. Please note that depending on your financial institution, it may take additional 2-10 business days for the credit to post to your account. For online purchases, Christian Louboutin will accept cosmetics merchandise for refund only when accompanied by the original sales slip. Christian Louboutin cosmetics products cannot be exchanged. Products must be completely unused and will only be accepted for return when in their original condition. Returned products must also be in their original packaging and must be shipped back in their original delivery box. Purchases must be returned to us within 14 days from the date of delivery (i.e., your return shipment must be postmarked within 14 days from receipt of your order). Shipping costs are non-refundable. A pre-printed return shipping label is included with all shipments for your convenience. We strongly advise all customers to check merchandise thoroughly upon delivery. For any discrepancies with your order upon receipt, please retain all documentation and packaging, and contact us immediately. Complete the return section on your return form and identify a return reason. Include the bottom half of this form with your return shipment. Pack merchandise in its original packaging. Use only the original delivery box for shipment. Merchandise returned in different packaging will not be accepted for return. Drop off your package at a staffed UPS store and collect a receipt for your records (for your closest location please visit www.ups.com) Do not use a drop box location for security. Christian Louboutin may refuse return on merchandise that does not meet the above requirements. If your package is not accepted, it will be sent back to you and a refund cannot be granted. 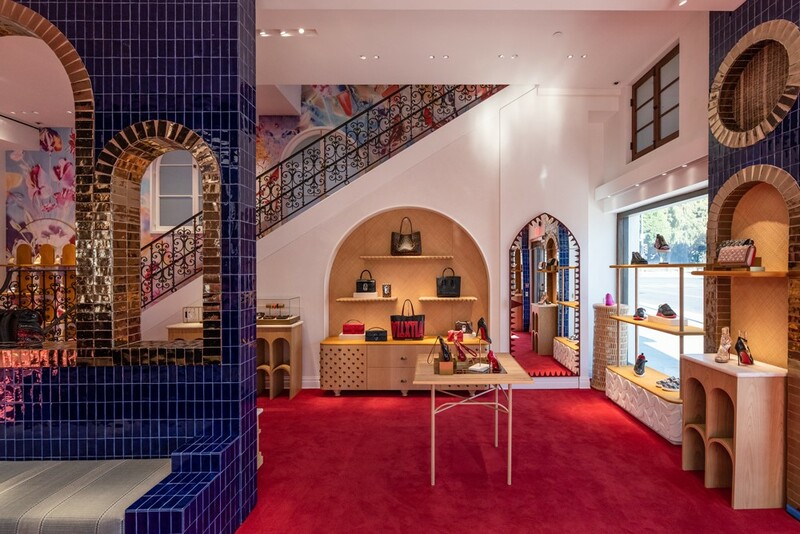 For online purchases Christian Louboutin will accept merchandise in its original condition for an exchange when accompanied by the original receipt. Returned merchandise must include the original shoe box, dust bag, and heel taps, and must be returned to us within 14 days from the date of delivery (i.e. your return shipment must be postmarked within 14 days from receipt of your order). Please follow all of the procedures and requirements in the Return Instructions above (11.1.2) to return your merchandise to our facility. We can facilitate a onetime direct exchange on an order upon request. A direct exchange can only be facilitated for a different size of the same style, or for another item of the exact same value. An exchange is subject to availability of the requested item at the time of processing and we will do our best to ensure your request is satisfied. Should the requested item not be available to fulfill your exchange, a refund will be issued to the original form of payment. We offer free ground shipping on your exchanged item(s). Please contact an online representative to confirm your exchange request by calling 1.888.8LOUBIS (1-888-856-8247) or via email at customerservice.ca@us.christianlouboutin.com. Please note we cannot facilitate a direct exchange on a PayPal transaction. Please be advised that the red soles of our shoes will become worn. Do not worry as this is not a defect of the shoe and is expected to happen from normal use. We strongly recommend consulting a leather care professional or cobbler for specific advice and maintenance. Keep leather surface clean and dry using a dry, soft cloth. Store your footwear away from light and heat. Protect leather goods from rain and humidity. When not in use, store your footwear in the dust bag provided. Should you need to repair or refurbish an item purchased online we are happy to suggest the following repair specialists. Please note Christian Louboutin has made these recommendations solely as a courtesy to those wishing to repair our products. Consumers who make use of this location have the sole responsibility for evaluating the suitability of the locations, their operations and the results of any repairs conducted thereby. Christian Louboutin assumes no responsibility or liability related thereto and makes no representation or warranty regarding, and does not endorse or approve, these repair specialists, or any of the products or services they offer. All orders are shipped with our standard shoe box and red tissue paper. We are also pleased to offer complimentary gift wrap. Please select this option and the style of wrapping paper you desire at the time of checkout. Our goal is to provide complete, accurate, and up-to-date information on our website. Unfortunately, it is not possible to ensure that any website is completely free of human or technological errors. This website may contain typographical mistakes, inaccuracies, or omissions, some of which may relate to pricing and availability, and product information. Not applicable to Residents of Québec: We reserve the right to correct any errors, inaccuracies or omissions, including after an order has been submitted and to change or update information at any time without prior notice. For all inquiries please contact us at 1.888.8LOUBIS (1-888-856-8247) or via email at customerservice.ca@us.christianlouboutin.com. Please note we are available Monday-Friday from 9AM-6PM(EST) excluding holidays, and Saturdays from 10AM-6PM (EST) excluding holidays. Christian Louboutin undertakes to ensure that high quality standards are continuously met in the manufacturing of all Products. Every Product is controlled before being shipped. However, if Your Product shows any defect, please contact the Customer Service immediately, and no later than five (5) days from the date of delivery, at the following email address: customerservice.ca@us.christianlouboutin.com. In such case, You must indicate in Your email the alleged defect and join every supporting document (detailed photos of the Product, purchase date, number of the Order, etc.). After considering these elements, Christian Louboutin reserves its right to recover the Product to conduct a physical investigation. In case of a recognized defect, Christian Louboutin undertakes to either replace the defective Product to the extent of available stocks, or to either partially or fully refund the purchase price to You, depending on the nature of the defect. Christian Louboutin may refuse to follow up on a claim relating to a defect for which You are responsible, or which derives from the nature of the Product (certain Products might have some uneven parts and/or irregularities which are parts of the manufacturing process or correspond to the material used). Not applicable to Residents of Québec: CHRISTIAN LOUBOUTIN MAKES NO WARRANTY THAT THE PRODUCTS WILL BE MERCHANTABLE OR FIT FOR ANY PARTICULAR PURPOSE. CHRISTIAN LOUBOUTIN MAKES NO WARRANTY EXPRESSED OR IMPLIED EXCEPT SUCH AS IS EXPRESSLY SET FORTH HEREIN. Christian Louboutin declines all liability for any losses which may be caused to merchandise or persons following handling or use which is contrary to the end purpose of the merchandise. Not applicable to Residents of Québec: Christian Louboutin’s sole liability and your exclusive remedy for any tender of nonconforming merchandise, for breach of warranty hereunder or otherwise under these Terms of sale, is expressly limited to Christian Louboutin’s choice of (i) the repair, (ii) the replacement, or (iii) the refund of the purchase price of the nonconforming merchandise. Any such repair, replacement or refund will be made only after return and Christian Louboutin’s inspection of the nonconforming merchandise. Christian Louboutin’s sole liability shall be limited to the price paid by the Customer for the merchandise on which such liability is based and in no circumstances shall Christian Louboutin be liable for any losses, damages, or expenses, whether incidental, consequential, exemplary, indirect, special, contingent, or punitive.